A beautiful stationery kit featuring all of the essentials! 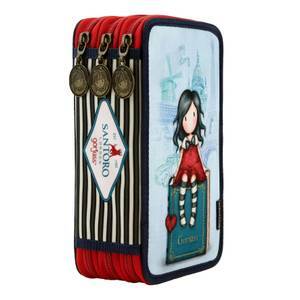 This sweet pencil case has 3 layers, all of which are revealed via zipped compartments and have love hearts and stars printed on the interior. The first layer has a pencil, 3 pens, an eraser, a sharpener, a protractor, a set square and a ruler. The second has 18 coloured crayons, and the third has 18 coloured felt tip pens; perfect for adding a splash of colour and brightening up notes! The exterior is detailed with the adorable My Story artwork in a rich colour palette of ruby red and midnight blue; iconic French landmarks decorate the background and chic stripes adorn the spine. This charming pencil case is a must-have addition for school or work!